PodShare Hollywood is custom built. You won't stay in a place like this anywhere else in the world. Since our pods are custom built into the wall, you never feel the person above or below you. Your pod is so roomy that you have space to spread out and put all of your belongings beside you. Turn left: the Walk of Fame, go to Jimmy Kimmel Live, Ripley's Believe it or Not etc. 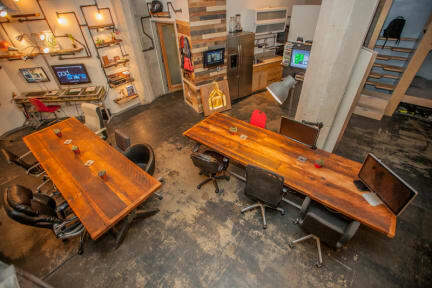 The Loft: 1200 sq. ft loft with 15ft ceilings. Hollywood Blvd on our left, Sunset blvd on our right. Walk to clubs, restaurants, theaters, banks, bars, coffee shops and people.